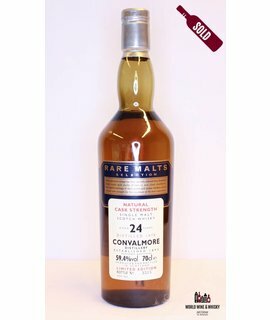 Convalmore is one of the seven Speyside distilleries that are mentioned in the famous quote “Rome was built on seven hills, Dufftown stands on seven stills”. Balvenie, Glenfiddich, Dufftown, Mortlach, Glendullan and Parkmore are the other six. Parkmore and Convalmore share the same fate and are closed and dismantled. But most buildings are still there and are used as warehouses. The Whisky that Convalmore produced was mainly used for blend as for example the Black & White and Lowrie’s. The style of Convalmore whisky is sweet, fruity and a bit spicy. Some bottlings from independent bottlers were available, for example a 26yo Convalmore-Glenlivet 1977/2003 from Cadenhead’s, matured in a Sherry Cask. This is one of the best judged releases of Convalmore Single Malt Whisky, presenting fruity aromas of oranges and gooseberries, paired with developing spices. 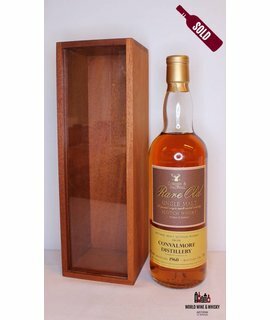 Only three times a Convalmore Single Malt Whisky was released as an official bottling: one Rare Malt Edition in 2003 and two 1977 vintages as part of the special releases in 2005 (28 years old) and 2013 ( 36 years old). All three official bottlings came out when the distillery already was closed and the premises were sold to William Grant. But as Diageo as the last owner and operator of the distillery still keeps the license they can continue to release a Convalmore Whisky if they want to. When the distillery was built in 1894 by the Convalmore-Glenlivet Distillery Co. Ltd. the whisky boom was at its peak. The most new distilleries of that time were designed and planned by Charles Doig, but Convalmore’s was Donald Mackay, a local architect. The company was successfully running the distillery for about a decade; because of the over production of whisky in Scotland the bubble burst and Convalmore was sold to W.&P.Lowrie & Co.Ltd. for £6.000 in 1904. Only a year later it was purchased by James Buchanan & Co.Ltd. A big fire destroyed big parts of Convalmore and it was rebuilt. When in 1925 Convalmore was sold to Distillers Company Limited (DCL), later United Distillers / Diageo, a period of constancy begun for Convalmore, only disturbed by modernization in 1962 and 1975. But in 1985 the time for whisky production at Convalmore was over. United Distillers mothballed it in 1985 and sold buildings and site to William Grant & Sons in 1990. They still use the dismantled buildings as warehouses so that Convalmore has survived although probably distilling never again will take place here. The license to sell Convalmore whisky is still in Diageo’s hands so we might find the name on a whisky label again in the future.